Definition – Fracture/dislocation of the articulation of the tarsal bones with the metatarsals of the foot. Clinical Significance – The Lisfranc joint of the foot is where the first three metatarsals articulate with the three cuneiforms and the fourth and fifth metatarsals articulate with the cuboid. 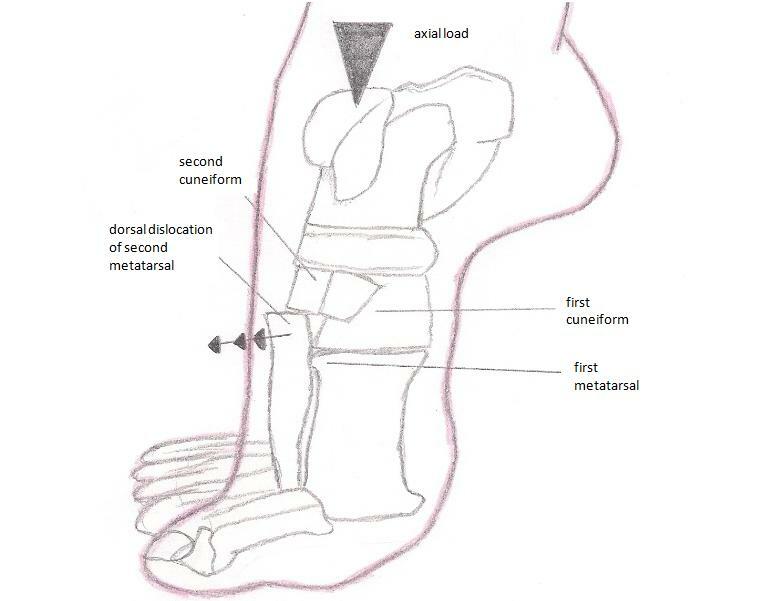 The Lisfranc ligament attaches the medial cuneiform to the 2nd metatarsal bone on the the plantar surface of the foot. This is a very serious injury of the foot and sometimes may simple present as a bad sprain. This injury is most common seen with direct crush injuries and indirect load onto a plantar flexed foot. History – This injury was first described by Jacques Lisfranc de St. Martin (1790-1847), a French surgeon who served in Napoleon’s army in 1813. He noted this injury pattern in Calvary soldiers who fell from their horse and caught their foot in the stirrup.